Eggnog is a popular seasonal beverage consisting of eggs, cream, sugar, spices and sometimes spirits. It is mostly associated with the American holidays of Thanksgiving and Christmas. A similar beverage can be found in the Netherlands (advocaat, typically contains alcohol) and Germany (Eierlikör). 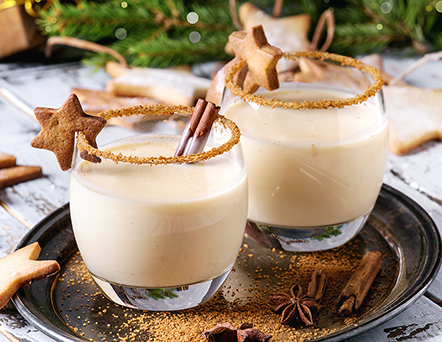 Modern commercial eggnog manufacturers add gelatin and other thickeners, a cost-savings measure that enables manufacturers to produce a thick beverage while using less egg and cream. FDA regulations only require that 1% of a product’s final weight be made up of egg yolk solids for it to bear the eggnog name. In Canada, commercial eggnog must contain eggs (Wikipedia). A food-grade, sanitary ProQuip tank agitator is typically used for food and beverage processing including eggnog. Other specifications for the eggnog mixing process including tank size and impeller design vary per the requirements of the individual producer. It’s fast and easy to make eggnog at home. Many recipes are available online. Here a few of the highest rated eggnog recipes (4.7 stars or better). Enjoy! For help with industrial tank agitator design for your eggnog or other commercial dairy process, email applications@proquipinc.com or call us at 330-468-1850.